Alastair Cook should step down as England skipper, says Shane Warne who has described his captaincy in the series defeat by Sri Lanka as "horrific". England lost the second Test by 100 runs after Sri Lanka captain Angelo Mathews scored 160 the day before to build a commanding lead of 350. Former Australian spinner Warne said: "On Monday at Headingley I witnessed the worst day of captaincy I have ever seen at international level in almost 25 years in the game." Warne has been a constant critic of Cook and the England captain recently called for a crackdown on "personal" attacks on his leadership. "You are only as good as your team. He was let down by his players but there were other options that Cook could have taken later on when that tactic wasn't working." "Cook is a very determined, stubborn man. That is what makes him a brilliant opening batsman, until this last year where he's clearly lost form. If he scores some runs and England start competing well against India, then much of this will die down." Opener Cook, who has said he will not resign as captain, made only 16 as England slumped to 57-5 on day four of the second Test against Sri Lanka at Headingley, though they came within two balls of securing a draw on Tuesday, thanks to Moeen Ali's unbeaten century. 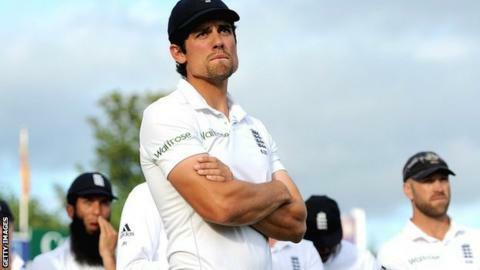 Former batsman Geoffrey Boycott said Cook's form was a "recipe for resignation". Warne, the second highest Test wicket-taker of all time with 708 victims, blamed Cook, 29, in his column for the Daily Telegraph. He said: "There are three ways to go with Alastair 'Cooked' Cook. Everyone sticks their head in the sand and just allows things to keep going as it is and hope he finds form with the bat and by a miracle discovers some tactical brains from somewhere. "Two: he steps down from the captaincy to concentrate on his batting. Three: the most radical of all, he has a complete break away from the game. "Lots of people, including me, think it is time for him to step down as captain." He added: "He is not thinking straight. He is not there. He is confused. He does not know what to do and, because he is in a rut with his form, it makes life a lot worse. You just cannot captain a team in transition in that frame of mind." Jonathan Agnew, BBC Radio 5 live's cricket correspondent, revealed that Warne was not at the Headingley match and said that while Cook is struggling he was badly let down by his players. Agnew added: "Cook will block it [the criticism] out but I have no doubt at all that this is getting to him. "If he scores some runs and England start competing well against India, then much of this will die down. He feels there is a vendetta against him." Warne stressed that his comments were not a personal attack on the Essex left-hander, or an attempt to undermine his authority. He said: "This column is not a personal attack and never has been, Alastair. Mate, you need to improve tactically or England need someone else in the job."